Available in Enterprise Edition E20. 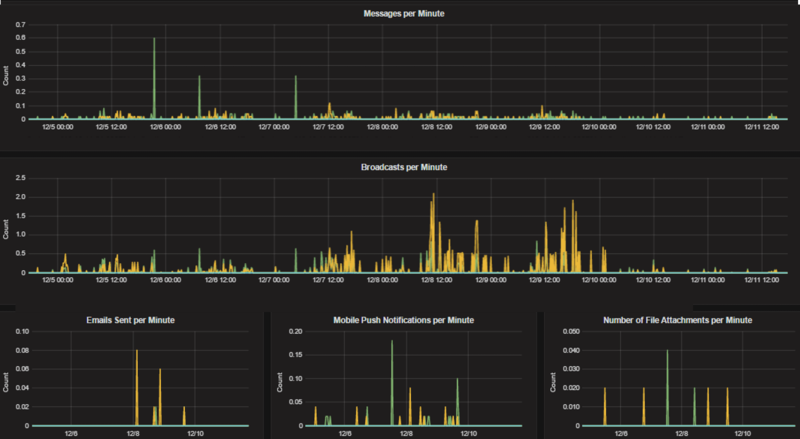 Performance monitoring support enables a Mattermost server to track system health for large Enterprise deployments through integrations with Prometheus and Grafana. The integration supports data collection from several Mattermost servers, particularly useful if you’re running Mattermost in high availability mode. Why Are Chart Labels Difficult To Distinguish? Details on integrating your Mattermost server with Prometheus and Grafana. 1 - Download a precompiled binary for Prometheus. Binaries are provided for many popular distributions, including Darwin, Linux and Windows. For install instructions, see Prometheus install guides. scrape_interval:     60s # By default, scrape targets every 15 seconds. evaluation_interval: 60s # By default, scrape targets every 15 seconds. # Override the global default and scrape targets from this job every 5 seconds. The <hostname1>:<port> parameter has to be replaced with your Mattermost host ip address and port to scrape the data. It connects to /metrics using http. 3 - Enable performance monitoring in the Mattermost System Console and specify the listen address. See more detail in our configuration settings documentation. After enabling performance monitoring, make sure to reboot Mattermost. 4 - To test the server is running, go to <ip>:<port>/metrics. 5 - Finally, run vi prometheus.yml to finish configuring Prometheus. For starting the Prometheus service, read the comprehensive guides provided by Prometheus. 6 - Once the service has started, you can access the data in <localhost>:<port>/graph. While you can use the Prometheus service to create graphs, we’ll focus on creating metric and analytics dashboards in Grafana. For troubleshooting advice, check the Prometheus FAQ page. 1 - Download a precompiled binary for Grafana on Ubuntu or Debian. Binaries are also available for other distributions, including Redhat, Windows and Mac. 2 - The Grafana package is installed as a service, so it is easy to start the server. See their install guides to learn more. 3 - The default HTTP port is 3000 and default username and password are admin. 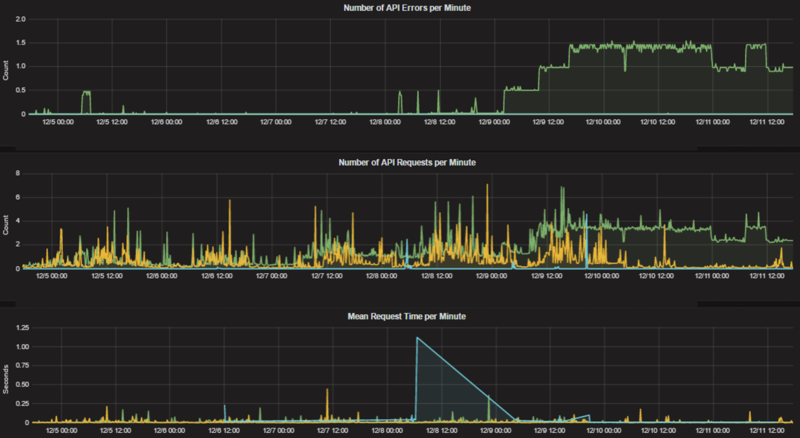 For troubleshooting advice, check the Grafana Troubleshooting page. For user guides and tutorials, check the Grafana documentation to learn more. Mattermost Performance KPI Metrics, which contains key metrics for monitoring performance and system health. Mattermost Performance Monitoring, which contains detailed charts for performance monitoring. Mattermost Performance Monitoring (Bonus Metrics), which contains additional metrics such as emails sent or files uploaded, which may be important to monitor in some deployments. See this guide to learn how to import Grafana dashboards either from the UI or from the HTTP API. 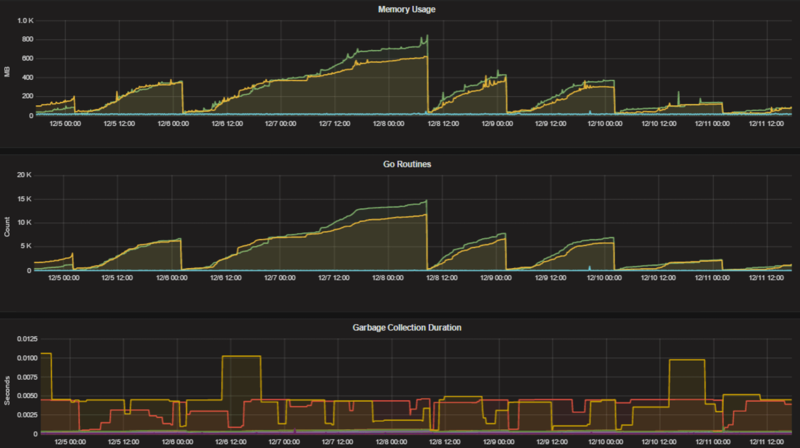 Mattermost provides the following performance monitoring statistics to integrate with Prometheus and Grafana. mattermost_cache_etag_hit_total: The total number of ETag cache hits for a specific cache. mattermost_cache_etag_miss_total: The total number of ETag cache misses for an API call. mattermost_cache_mem_hit_total: The total number of memory cache hits for a specific cache. mattermost_cache_mem_miss_total: The total number of cache misses for a specific cache. The above metrics can be used to calculate ETag and memory cache hit rates over time. mattermost_cluster_cluster_request_duration_seconds: The total duration in seconds of the inter-node cluster requests. mattermost_cluster_cluster_requests_total: The total number of inter-node requests. mattermost_cluster_event_type_totals: The total number of cluster requests sent for any type. mattermost_db_master_connections_total: The total number of connections to the master database. mattermost_db_read_replica_connections_total: The total number of connections to all the read replica databases. mattermost_db_search_replica_connections_total: The total number of connections to all the search replica databases. mattermost_http_errors_total: The total number of http API errors. mattermost_http_request_duration_seconds: The total duration in seconds of the http API requests. mattermost_http_requests_total: The total number of http API requests. mattermost_http_websockets_total The total number of WebSocket connections to the server. mattermost_login_logins_fail_total: The total number of failed logins. mattermost_login_logins_total: The total number of successful logins. mattermost_post_broadcasts_total: The total number of WebSocket broadcasts sent because a post was created. mattermost_post_emails_sent_total: The total number of emails sent because a post was created. mattermost_post_file_attachments_total: The total number of file attachments created because a post was created. mattermost_post_pushes_sent_total: The total number of mobile push notifications sent because a post was created. mattermost_post_total: The total number of posts created. mattermost_post_webhooks_totals: The total number of webhook posts created. mattermost_process_cpu_seconds_total: Total user and system CPU time spent in seconds. mattermost_process_max_fds: Maximum number of open file descriptors. mattermost_process_open_fds: Number of open file descriptors. mattermost_process_resident_memory_bytes: Resident memory size in bytes. mattermost_process_start_time_seconds: Start time of the process since unix epoch in seconds. mattermost_process_virtual_memory_bytes: Virtual memory size in bytes. mattermost_search_posts_searches_duration_seconds_sum: The total duration, in seconds, of search query requests. mattermost_search_posts_searches_duration_seconds_count: The total number of search query requests. mattermost_websocket_broadcasts_total: The total number of WebSocket broadcasts sent by type. mattermost_websocket_event_total: The total number of WebSocket events sent by type. To learn how to set up runtime profiling, see the pprof package GO documentation. You can also visit the ip:port/metrics page for a complete list of metrics with descriptions. The chart labels used in server filters and legends are based on the hostname of your machines. If the hostnames are similar, then it will be difficult to distinguish the labels. You can either set more descriptive hostnames for your machines or change the display name with a relabel_config in Prometheus configuration.